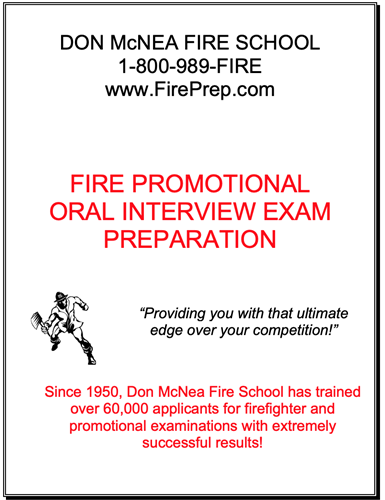 Don McNea Fire School’s Assessment Center Oral Interview Exam Preparation has been put together by Fire Chiefs who are nationally-recognized authors and who have been assessors for hundreds of fire promotional interviews. This Assessment Center Oral Interview Examination Preparation package is the most detailed, comprehensive, to-the-point oral exam prep available. We back up that statement with our money-back guarantee – if you are not completely satisfied, we will refund 100% of the product cost – no questions asked. How can we give such a guarantee? Simple! Our Assessment Center Oral Interview Exam Prep package is very detailed and in-depth and has successfully worked for hundreds of promotional candidates across the country. This is not generic exam prep! The primary goal of this exam prep is to help you build a solid foundation from which you can confidently and effectively demonstrate your oral interview skills in solving related issues that may be presented to you during your oral interview.